Restorative dentists frequently require improved access to specific teeth for proper crown preparation and final impressions. 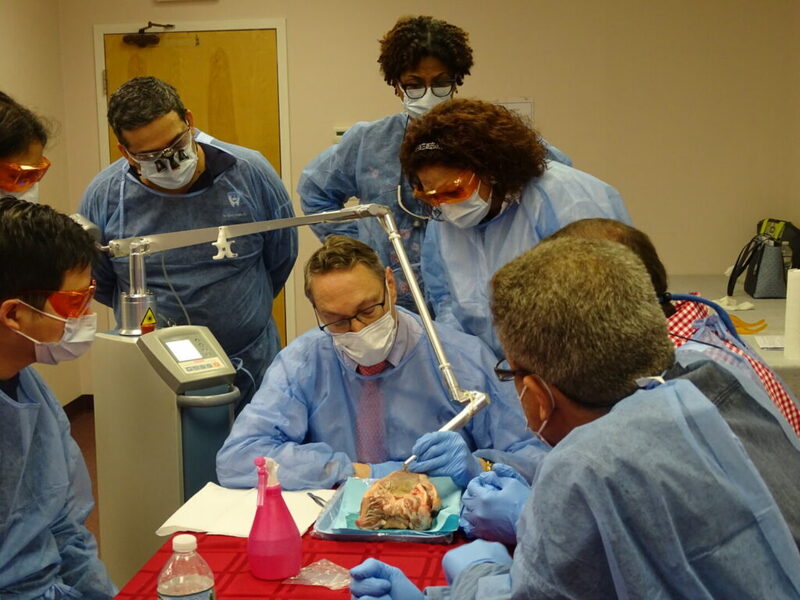 This hands on course will teach surgical diagnosis and surgical therapies to permit access to teeth for ideal treatment planning. Full thickness flaps and osseous contouring techniques, post op management and pain control are included in this course. Lecture, videos, and case reports will enhance and provide confidence to immediately apply in your practice. Now extended - 3 spots remaining! Restorative Dentists frequently require improved access to specific teeth for proper crown preparation and final impressions. 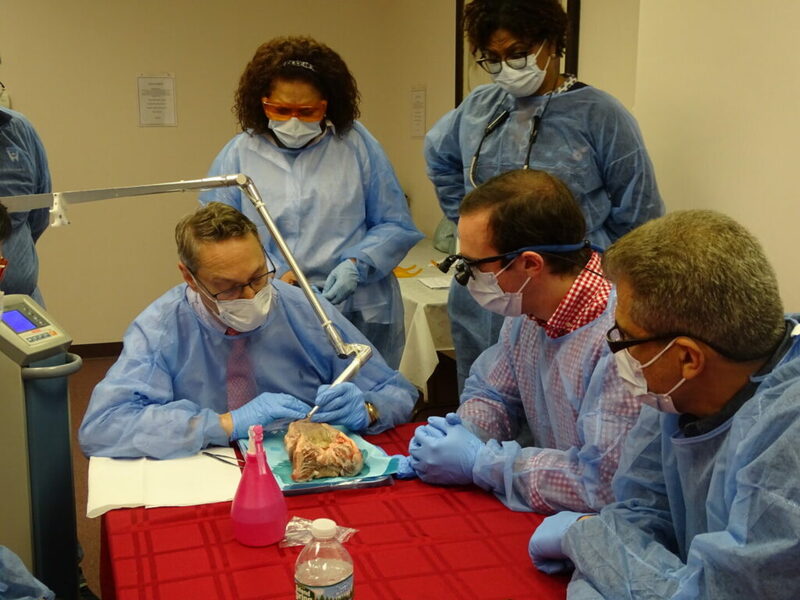 This hands on workshop (pig jaws) will teach surgical diagnosis and surgical therapies for the restorative dentist to permit access to teeth for ideal treatment planning. Full thickness flaps and osseous contouring techniques as well as post op management and pain control are included in this course. Lecture, videos, and case reports will enhance and provide confidence to complete these surgeries for immediate application in clinical restorative practices. Dr. Jon Suzuki holds Clinical Professorships at the University of Maryland, the University of Washington and Nova Southeastern University. He is also on the faculty of the US Navy Walter Reed National Medical Center, Bethesda, MD. Dr. Suzuki is Professor Emeritus of Microbiology and Immunology (School of Medicine) and Professor Emeritus of Periodontology and Oral Implantology (School of Dentistry) at Temple University, Philadelphia, PA. USA. 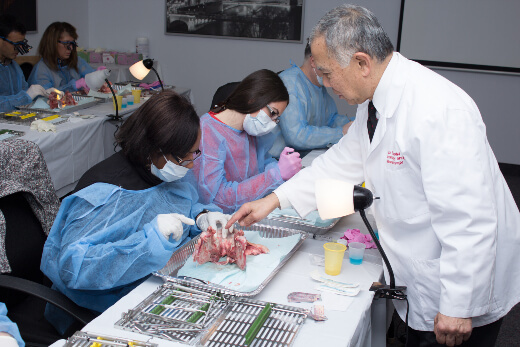 He served as Chairman and Director of Graduate Periodontology and Oral Implantology, and Associate Dean for Graduate Education at Temple University. He also served as Dean, Chief of Hospital Dentistry, and CEO of the Faculty Practice Plan at the University of Pittsburgh, USA. Dr. Suzuki is the current Chairman of the Food and Drug Administration Dental Products Advisory Panel, Silver Spring, MD. and holds this position until 2022. Dr. Suzuki received his D.D.S. from Loyola University of Chicago and Ph.D. in Microbiology from the Illinois Institute of Technology. He completed an N.I.H. Fellowship in Immunology at the University of Washington, and a Clinical Certificate in Periodontics at the University of Maryland. He earned an MBA from the Katz Graduate School of Business at the University of Pittsburgh. He served as Chairman of the American Dental Association Council on Scientific Affairs and continues to serve as ADA consultant on the Scientific Council, Dental Practice Council, and the Commission on Dental Accreditation, Chicago. Dr. Suzuki served on the National Institutes of Health National Dental Advisory Research Council, and numerous NIH Study Sections in Bethesda, MD. Dr. Suzuki is a consultant for the Veterans’ Affairs Medical Centers. Dr. Suzuki is the current Executive Secretary/Treasurer of the Supreme Chapter of Omicron Kappa Upsilon, the National Honorary Dental Society, and has served in this position for over a quarter of a century. His honors include being named “Alumnus of the Year” at the University of Maryland, “Alumnus of the Year” at Loyola University of Chicago; “Alumnus of the Year”, Illinois Wesleyan University; “Recognized Alumnus in Biological Sciences”, Illinois Institute of Technology; and “Faculty of the Year” University of Maryland. Dr. Suzuki won 1st place, Orban Prize Graduate Research Competition of the American Academy of Periodontology and won 1st place in the ADA SCADA Research Clinic Competition. 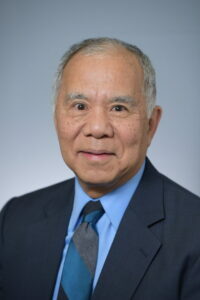 Dr. Suzuki is an attending at Temple Episcopal Hospital in Philadelphia. "Easy step by step instruction on common perio procedures that can be done Monday morning in your office. All steps for technique were covered with great detail. Simple to do. Very complete presentation which covers all related topics to crown lengthening procedure. Great pearls to keep you safe." “It is a pleasure listening to Dr. Suzuki. His lectures are precise, insightful and filled with real world advice and knowledge." "Great course! Dr. Suzuki brings a wealth of knowledge with many helpful clinical tips. I feel confident to try the procedures learned on Monday!" "Excellent coverage of topic. Dr. Suzuki is an excellent speaker with only valuable information to share." "I think it was very informative. I also liked that Dr. Suzuki actually included medical considerations." "Dr. Suzuki was great, great teacher, very informational, makes it very easy to understand. I would definitely go to another of his lectures." "Very clear lecture to the point. Hands-on portion was great." "Dr. Suzuki is excellent - presentation organized, key points to help us understand. NJHPDI is always helpful and facilitates learning experience."